An Audience Response System Community Where you can find The Best and Affordable Audience Response System in the Market Today! 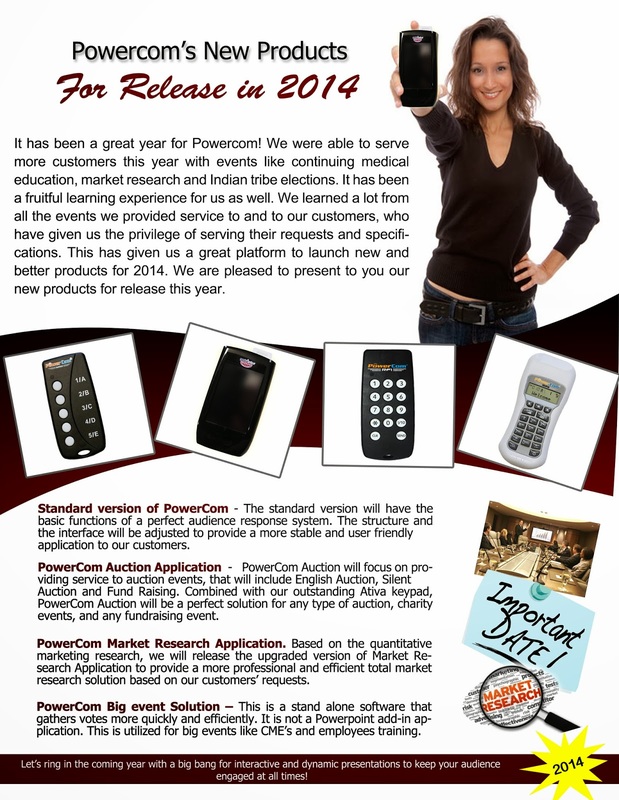 It has been a great year for Powercom! We were able to serve more customers this year with events like continuing medical education, market research and Indian tribe elections. It has been a fruitful learning experience for us as well. We learned a lot from all the events we provided service to and to our customers, who have given us the privilege of serving their requests and specifications. This has given us a great platform to launch new and better products for 2014. We are pleased to present to you our new products for release this year. 1. Standard version of PowerCom - The standard version will have the basic functions of a perfect audience response system. The structure and the interface will be adjusted to provide a more stable and user friendly application to our customers. 2. PowerCom Auction Application - PowerCom Auction will focus on providing service to auction events, that will include English Auction, Silent Auction and Fund Raising. Combined with our outstanding Ativa keypad, PowerCom Auction will be a perfect solution for any type of auction, charity events, and any fundraising event. 3. 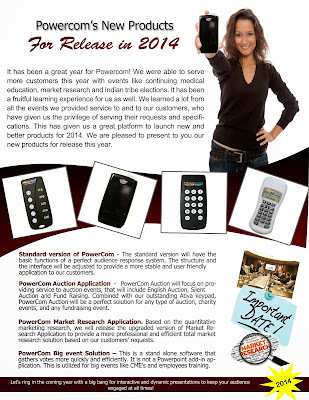 PowerCom Market Research Application. Based on the quantitative marketing research, we will release the upgraded version of Market Research Application to provide a more professional and efficient total market research solution based on our customers’ requests. 4. PowerCom Big event Solution – This is a stand alone software that gathers votes more quickly and efficiently. It is not a Powerpoint add-in application. This is utilized for big events like CME’s and employees training. Let’s ring in the coming year with a big bang for interactive and dynamic presentations to keep your audience engaged at all times! Audience Responses. Powered by Blogger. Powercom Audience Response System Used At ICEME 2016 Event. If you’re an AV company you don’t want to conduct business without this.